This book is based on a set of notes developed over many years for an introductory course taught to seniors and entering graduate students in materials science. 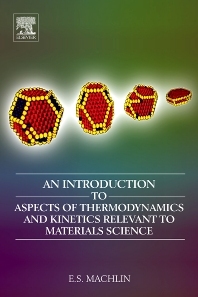 An Introduction to Aspects of Thermodynamics and Kinetics Relevant to Materials Science is about the application of thermodynamics and kinetics to solve problems within Materials Science. Emphasis is to provide a physical understanding of the phenomenon under discussion, with the mathematics presented as a guide. The problems are used to provide practice in quantitative application of principles, and also to give examples of applications of the general subject matter to problems having current interest and to emphasize the important physical concepts. End of chapter problems are included, as are references, and bibliography to reinforce the text. This book provides students with the theory and mathematics to understand the important physical understanding of phenomena.